Hallucinogenic drugs have been used by many cultures and subcultures over the centuries--from ancient religious ceremonies to the enlightenment movement in the 1960s to today's all night "Rave" parties. They continue to be a major concern for law enforcement and social policy makers. Hallucinogens is designed to be a cross-disciplinary source of information and help. The text reviews the history of these drugs and their abuse, and then takes an in-depth look at the various hallucinogens including their chemical make-up, how they affect users, how they are manufactured and distributed, and how they can be detected and analyzed. 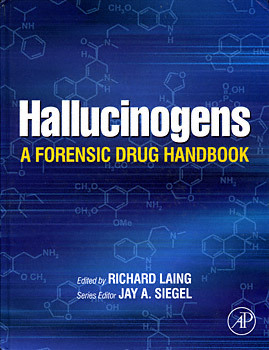 Hallucinogens: A Forensic Drug Handbook is a comprehensive reference for everyone involved in the identification, investigation, and forensic analysis of hallucinogenic drugs. It covers the most commonly abused drugs such as LSD, MDMA ("Ecstasy"), and PCP ("Angel Dust"), as well as many lesser-known chemical substances that can be used to achieve similar effects. Richard Laing, MSc is an Analytical Specialist with Health Canada's Drug Analysis Service Laboratory in Burnaby, British Columbia. He has spent the last twelve years working in clandestine laboratory investigations and is recognized as a leading expert in this field. Mr. Laing is a member of the international standard setting committee, SWGDrug, and a faculty member at the British Columbia Institute of Technology in Forensic Science. Jay A. Siegel, PhD currently coordinates and teaches in the Forensic Science Masters program at Michigan State University in East Lansing. He is a fellow of the American Academy of Forensic Sciences (AAFS), serves on the editorial board of the Journal of Forensic Sciences, and is a member of the Forensic Science Society in the UK.